Throughout 2016 and 2017, owner Paige Laurie is set to bring new tenants into the market with multi-brand boutiques, designer stores, and revamped restaurant offerings. Trancas Country Market, the beautiful shopping center located in western Malibu, today unveils future plans to introduce upscale retail tenants, exceptional café and dining experiences and new outdoor seating areas. The center remains committed to the local community, while at the same time welcoming tourists and neighboring visitors through the addition of these new offerings. Throughout 2016 and 2017, owner Paige Laurie is set to bring new tenants into the market with coveted multi-brand boutiques, designer stores, and revamped restaurant offerings. To support Laurie’s vision, RKF, the leading independent retail real estate firm in the US, is redeveloping the center to align with the right opportunities. RKF Vice Chairman Robert Cohen, Executive Vice President Rachel Rosenberg and Associate Samantha Federman have been assigned to handle the leasing efforts for the center. This new direction has already come to life with the launch of Vintage Grocers, which celebrated its two-year anniversary on March 5th. Providing a curated, community-minded market of gourmet, organic, natural, and conventional foods, Vintage Grocers embraces all food beliefs and brings a truly intimate shopping experience to customers. Owned by Laurie and developed in collaboration with the store’s market director Eric Fuchser, Vintage Grocers’ expansion into other LA neighborhoods is currently in the works with its second location coming to The Promenade at Westlake in fall 2016. In addition, the debut location of “Le Village Café,” a hearty American café, is opening its doors early spring at Trancas Country Market. Founded by French restauranteur Francois Clausse, Le Village Café will serve a full menu with delicious offerings centered on fusion food and 100% organic produce. Monsieur Clausse has successfully overseen the launch of numerous eateries, bars, clubs, and hotels across Europe throughout his career. His latest endeavor with Trancas Country Market not only honors the discerning preferences of the Malibu community, but heightens the standard of neighborhood culinary attractions. As Trancas Country Market comes to life, patrons are invited to browse stores, enjoy the open-air commons, peruse a much-loved local garden nursery and more. For more information about Trancas Country Market, please visit www.trancascountrymarket.com. 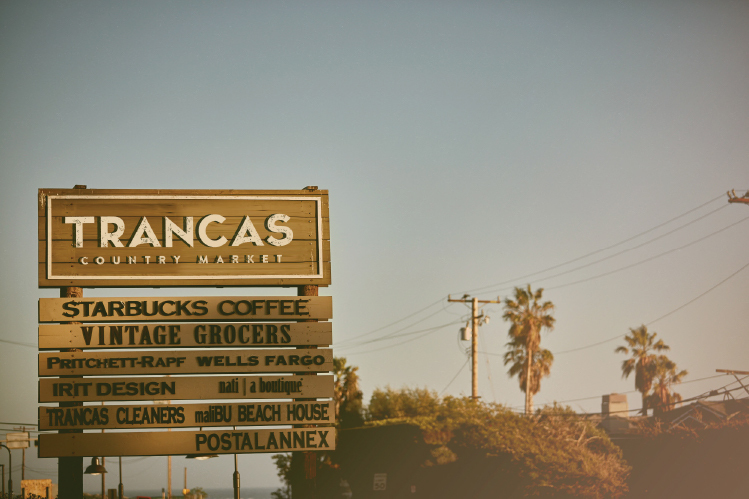 Trancas Country Market is an upscale shopping destination located in the heart of Malibu, CA. Throughout 2016, owner Paige Laurie will redevelop the property with new tenants including high-end boutique and designer stores, as well as local artisans and brands. Other attractions on the beautiful grounds feature exceptional café and dining experiences, an open-air commons, garden nursery and more. As the plan unfolds over the coming year, the center’s new direction is designed to cater to the Malibu community, while welcoming tourists and neighboring visitors. The leading independent real estate firm in North America specializing in retail leasing, investment sales and consulting services, RKF serves a broad spectrum of domestic and global clients in services ranging from national tenant and owner representation to advisory, consulting and dispositions. With approximately $30 billion in aggregate real estate transactions to its credit, RKF has been responsible for identifying scores of real estate opportunities throughout the United States for leading American and international chains, retailers, developers and institutional clients. RKF is headquartered in New York with offices in Chicago, Las Vegas, Los Angeles, Miami, Northern New Jersey, San Francisco and Toronto. RKF operates in Canada as RKF Group Canada Realty, a retail brokerage.